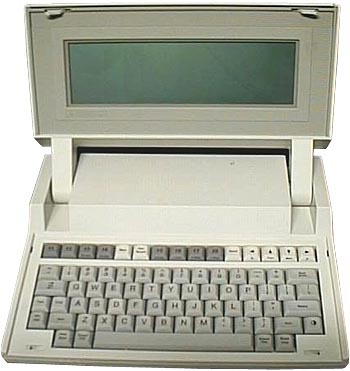 The HP-110 was the first laptop computer to offer the power and the possibilities of a desktop. As it was possible to connect a printer and a disk-drive to it, it was a very serious machine in its category, with Lotus 1-2-3 integrated. This was the good occasion for Hewlet-Packard to introduce a laptop computer when IBM and Apple were not yet on this part of the market. The HP-110 is somehow compatible with its big brother, the HP-150, and can communicate with HP "calculators" like the HP-41c. Its design looks like the Dulmont Magnum or the Gavilan produced at the same time. The screen can be tilted to accomodate the right angle of vision for the user. The HP-110 is equiped with a 8086 16-bit CPU which is much more powerful than the 8088 for example used in the HP-150. One year later, HP presented the Portable Plus with bigger screen, more memory upgrade and the possibility to change the internal ROM software. The HP-110 and Portable Plus were actually multi-processor computers! I see something on the schematic called a PPU, and its part number seems to be 146?0562. But it's blurry; the ? might be 3 or 8, and the 0 might be an 8. In sleep mode, the 8086 is powered off, and the PPU is given the job of keeping the time, controlling the power supply and charger, monitoring the power button, etc. see more Hewlett Packard HP-110 Ebay auctions !